Arunachal Pradesh Chief Minister Pema Khandu on Tuesday began his tour of ‘Arunachal Rising Campaign’ – a two-month long comprehensive publicity campaign to disseminate information on major State and Central flagship programmes to the people of the State, starting from the Longding district. Addressing a large gathering, Khandu said the need is now to bridge the gap between the people and the government. “People always come first. The CM, ministers, Government officers and workers, all are paid to serve the people. This campaign has been initiated to ensure that we all do justice to our position,” he said. The CM in his speech said the State Government is focusing on three sectors – education, health and law and order. He said if these sectors are prioritized, it will facilitate other sectors to grow fast. Khandu said the ‘Sarkar Aapke Dwar’ (government at your doorstep) programme is achieving its intended objective and besides guaranteeing benefits to the people, Government officers are also expressing job satisfaction. He lauded the local administration for carrying out the ‘programme successfully across the district despite manpower shortage. He assured that all the manpower shortage for running the newly created district administration offices will be met soon. He said Longding district is lucky to begin the Arunachal Rising campaign through these sectors with the inauguration of a Vivekananda Kendra Vidyalaya, a primary health centre and the laying of foundation stone for the upgradation of police station, which was earlier launched by the CM. The CM also inaugurated an unemployed women’s hostel and the mega health camp here. 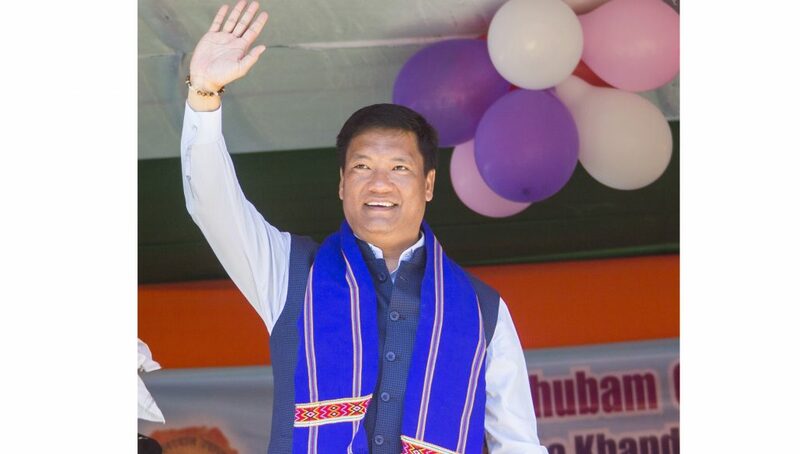 Highlighting about major achievements made by the state government in completing all earlier incomplete projects, Khandu informed that Prime Minister Narendra Modi is scheduled to visit the State in January to inaugurate the projects – 100MW Pare HEP, 600MW Kameng HEP, Arunachal’s longest 6.25 km Dibang project. “The prime minister would also lay the foundation stone for construction of road tunnel bypassing Sela Pass towards Tawang,” the CM informed. The CM on the occasion felicitated the ground level functionaries who are working for the people at the grassroots and changing the face of Arunachal through their dedicated service. He gave away felicitation to the three best ASHA workers, progressive farmers and the Anganwadi workers from the district. Khandu also gave away prizes and certificates to the winners of the essay writing competition organized under the Arunachal Rising campaign across the schools in the district. About 1000 women were provided free LPG connection in the district under Ujwala Yojana and the chief minister handed over the Yojana benefit to the beneficiaries. He also handed over cheques to 34 women beneficiaries under Mudra Yojana, who were provided loan through the SBI.